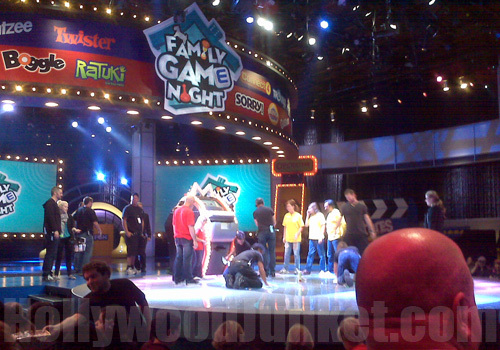 The Hub network will premiere its second season of “Family Game Night” this Labor Day on Friday, September 2 at 7/8pm ET. The show is hosted by Daytime Emmy nominee Todd Newton, who obviously enjoys this job and is an excellent host. Show announcer is Burton Richardson of Family Feud. We attended two days of filming during this new season of shows. 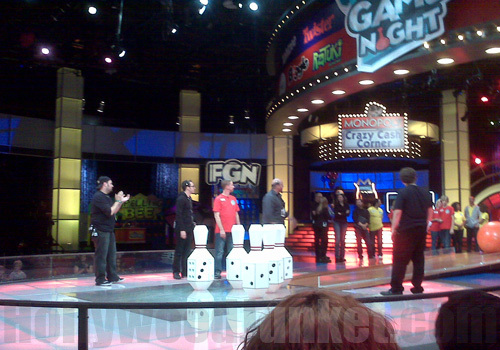 We witnessed the following games: Cranium Piano, Yahtzee Bowling, Green Scream (new this season), and Guesstures. Production of the show is set-up to film four shows at the same time. Four pairs of families are brought-out one after the other to compete against each other in life-sized board games. Once a game is completed by one family, another set of families is brought-out to play the same game, and so on until all of the families have played that game. Then, a new game is set-up for the line of families to compete in. After winning a game, a family member, usually the team captain which is the youngest member in the family, gets to select a monopoly piece from the “Monopoly Crazy Cash Corner” that is worth money and place it in their treasure bank. This piece is loaded with a money amount in which they do not find out until they insert it into the “Cash Machine” in the last round. Each family consists of four members. While playing “Guestures”, three family members are raised into the air in harnesses. One family member must guess clues given to them by each family member by using body gestures. The family with the fewest passes wins. A new game introduced this season is called “Green Scream”. The two children in a family are placed in sleeping-bag style green sacks and must roll around an open circular platform to reveal to the parents parts of a enlarged photograph on a huge screen that the parents only see parts of at a time as the kids are exposing the image with movements. Parents have one minute and thirty seconds to solve the image puzzle. "Family Game Night" Cash Machine! The most one Monopoly card can contain is up to $20,000, others can be worth up to $10,000. The grand prize is a trip. Two of the trips that families won were to: San Cabo, Mexico, and Orlando, Florida. Each family wins and gets to keep the money amount on each Monopoly card that is earned throughout the game. Monopoly pieces selected by team captains are from the board game – iron, skateboard, etc. In each game played, families also have the opprotunity to win prizes along the way that they keep whether or not they win the final round. Some of these prizes included: “Trampoline Beach Party” sponsored by “Body Glove”, a Karaoke machine, and a flat screen television. The final round of “Family Game Night” has each family feeding their Monopoly cards into the “Cash Machine” that digitally reads the money amount then spits out large fake Monopoly bills. The family with the biggest money amount wins the money and the trip! But, there are no losers on the “Family Game Night” because each family gets to keep their cash and prizes earned throughout show.